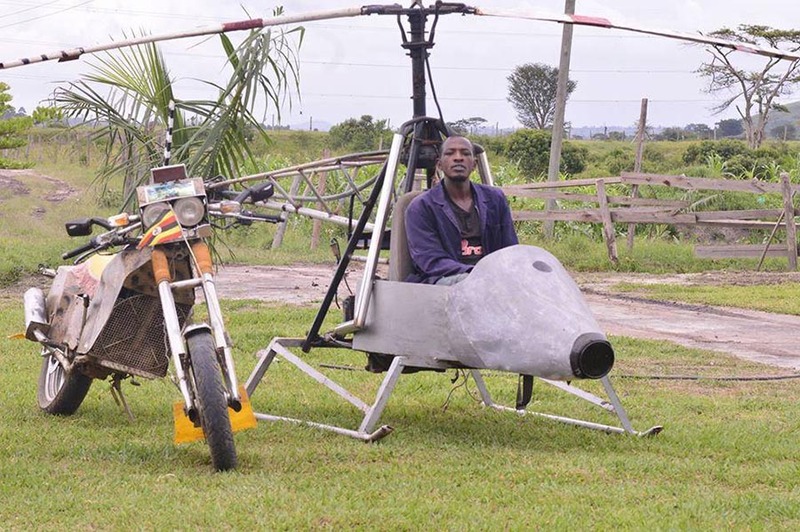 Joseph Nkaheza, a primary seven drop out who is known for locally making Uganda’s first private chopper and Motorcycle is nursing injuries sustained during a crash while he tested the aircraft. Nkaheza was trying to test the chopper after making a few more touches on it when it came back down crashing, injuring him in the process. The accident happened along Mbarara- Kabale highway. The self taught engineer sustained injuries on the head and shoulders. When contacted, Nkaheza said he was recovering steadily. He had been admitted to a clinic in Ruti, Mbarara District. “I have been discharged, I am now fine, doctors tell me I did not get any internal bleeding. 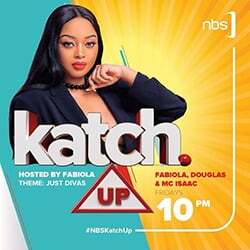 The only problem is that now I am starting to get scared of technology, it may kill me before I accomplish my mission,” Nkaheza told Nile Post. Nkaheza has crashed a record three times before, once breaking his hands and on another occasion sustaining grave head injuries after the chopper failed him to land. 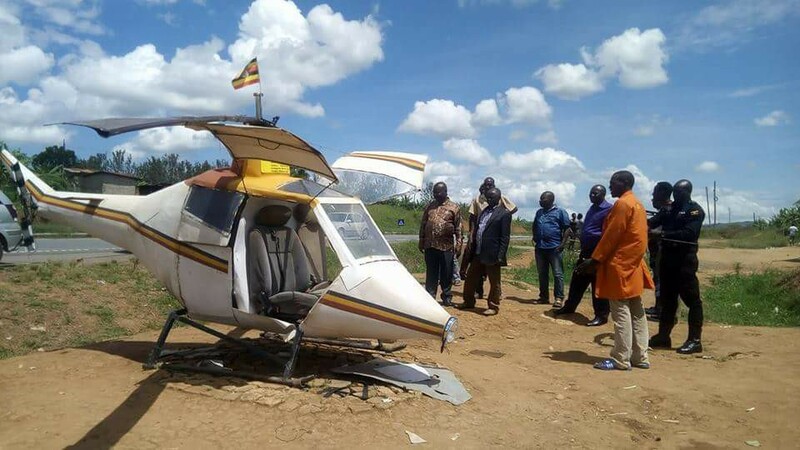 The inventor from Mwizi, Mbarara District however says he had rectified the landing problem and it was not the cause of the crash. “The chopper has been flying and landing, it has actually flown for over 5km recently, but the machines are now old and they gave way while it was in the air,” he said. Nkaheza says he used steel to make his chopper after failing to purchase aluminium materials which were too expensive. This means that the Ugandan inventor is the first to make a plane without aluminium components fly. He says the plane uses an engine of a maize mill and sprockets or cogs from motorcycles. Nkaheza also used wood to guard against short-circuits or lightning. He says the wood enables lights and the battery to operate without touching the steel that would in end cause a short-circuit. However, Nkaheza still wonders why the government is not supporting his initiative. The inventor says that he met President Museveni who promised to support his initiatives but the help has never come. “The President gave me someone called Afande Nalweiyso (Brig Proscovia Nalweyiso), but she has never picked my calls or reached out to me. She actually just dodges me. I wonder why no one is supporting me,” he said. He says city socialite and money bags Bryan White Kirumira gave him Shs5m to help finish the chopper but a lot more help is needed. 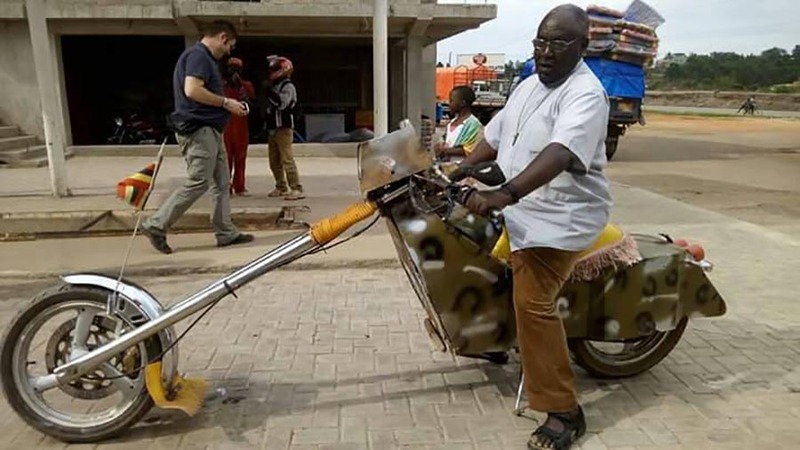 Nkaheza also made an aluminium motorcycle which he rides from Mbarara to Kampala to attend his parties. The Motorcycle does not use fuel. “I don’t have anyone to help me, only the media has marketed me. The other people just promise but never help,” he said. The inventor only ended in Primary Seven but says any technology training is highly appreciated.